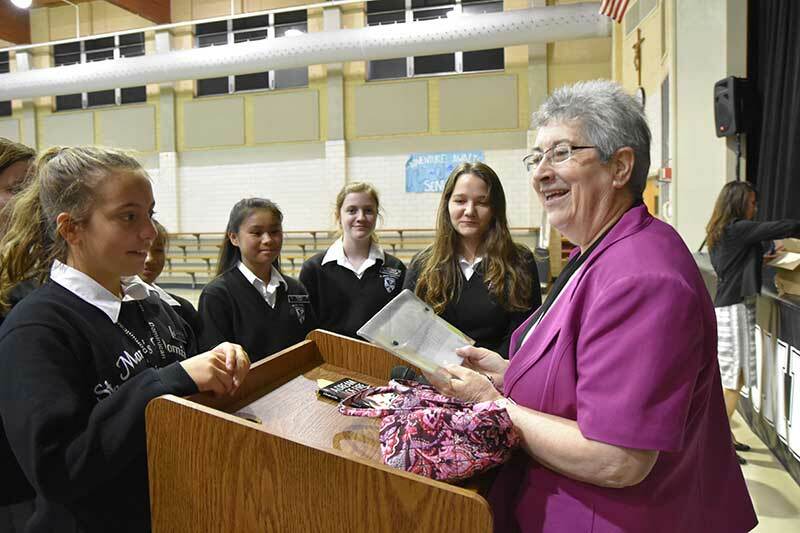 In a visit to St. Mary’s Dominican High School, Sr. Maeve McMahon, O.P., a Cabra Dominican Sister, educator and author of, “A Dream of Fire: A Story about Dominic Guzman,” shared with the Eighth Grade Class her inspiration for the book. In “A Dream of Fire” Sr. Maeve tells the story about Dominic whose mother dreamed before his birth that he would set the world on fire with zeal for God’s Truth – Veritas. The book for young readers was launched in December 2015when the Dominican Order began its 800th anniversary year. A native of Belfast, Northern Ireland, Sr. Maeve’s teaching career began in her home town and continued in New Orleans where for 27 years she was a teacher and principal. Hurricane Katrina in August 2005 forced her evacuation from a newly opened pilot school and she returned to Ireland. The experience inspired her to write, “Riding Out Hurricane Katrina.” It won the Silver Nautilus Award.